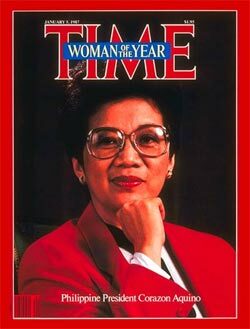 Another sad obituary from the Philippines: Cory Aquino, wife of Ninoy Aquino, heroine of the EDSA People Power Revolution that ousted dictator Ferdinand Marcos, and President of the Philippines from 1986 to 1992, died from complications due to cancer on August 1st, 2009. She was 76. As wife to Marcos’ most dangerous political opponent she saw her husband imprisoned, tortured, exiled, and finally assassinated; as rallying point for the 1986 revolution she took the reins of power with humble reluctance; as President she survived through seven military coup attempts, and while not the best president, she did work hard to help preserve the democracy that she had helped replant in the Philippines. I have heard tell that her son Noynoy Aquino plans to run for president — he still has a bullet in his neck from when he was attacked during one of the coup attempts against his mother. One of his possible choices for running mate is another presidential hopeful, Mar Roxas, grandson of former Philippine President Manuel Roxas. Meanwhile, Gloria Macapagal-Arroyo continues to advocate measures to extend her power, the Marcoses continue to roam the political landscape, and Joseph Estrada is thinking of running for president again. It makes me wonder whether EDSA and its sequels were really just proxy battles to maintain existing Filipino political dynasties, and how much of Cory’s legacy is left after two decades of squandering. Cory Aquino and the people’s triumph over tyranny, by Fatima, a classmate from college now teaching in Australia. Reports from the Philippine Daily Inquirer, and a photo of Cory lying in state from Inquirer’s Twitter. Time Magazine’s obituary, with the cover photo from when Cory was Time’s 1987 Woman of the Year. More obituaries from ABS-CBN News, Foreign Policy Passport, CNN, NYT, SFGate, and LA Times. For a flashback to 1986, check out this amazingly detailed timeline of events, assembled from interviews and eyewitness accounts from the EDSA Revolution.